Welcome to the world of mobile application development with the CLI Apache Cordova framework. This article is a tutorial on building a torch application for Android using Web technologies and Apache Cordova. Mobile apps are everywhere, from smartphones to tablets and now even on smart watches. But developing an app for each specific platform or device can be a tedious task. Imagine a situation where you have an idea for an app and you want to build that app for your target platforms — Android, iOS and Windows. In simple words, it is like developing that same app three times using platform-specific SDKs and APIs. This can be tedious and time consuming. What if there was a way to develop an app that will run on all platforms? This is where Apache Cordova enters the picture. A Cordova app has several important components, which are listed below. WebView: WebView provides the application with its entire user interface, which means you will see your app interface through the WebView component. Think of it as a browser that displays Web pages (user interface). In fact, WebView is an HTML rendering engine, which renders HTML pages. 1. Download and install Node.js (https://nodejs.org/). The Cordova command line tool is distributed as an npm package, so we will use Node and npm to install Cordova. 2. Install the Cordova module using the npm utility of Node.js. The Cordova module will be automatically downloaded by the npm utility. After the installation, you should be able to run cordova on the command line with no arguments, and it should print the help text. In this article, we are going to create a torch app for an Android mobile using Apache Cordova. This is an app that will switch the camera flash of the mobile, on or off, on the press of a button. This command statement creates the required directory structure for your Cordova app. cordova create: This script generates a default Web-based application whose home page is the index.html file in /www directory. This page loads up when you run your app. In short, this is the entry point of the app. torchapp: This is the name of the directory in which the app will be created. com.app.torch: This is the default reverse domain value, in which the classes will be stored. You can use your own domain value. Torch: This is the name (title) of the app. hooks\: This directory is used to store scripts for customising cordova-cli-commands. platform\: This directory contains all the scripts and source code for the platform that you add to your Cordova project. plugins\: This directory is used to store plugins, which will be used in the app. config.xml: This file contains all the important information about the Cordova app, such as its name, description, content-src, etc. It allows you to customise the behaviour of your project. The above command statement will add the Android platform to the Cordova project. If we want to add any other platform, say iOS, we just need to replace the keyword ‘android’ with ‘iOS’ and run the command. 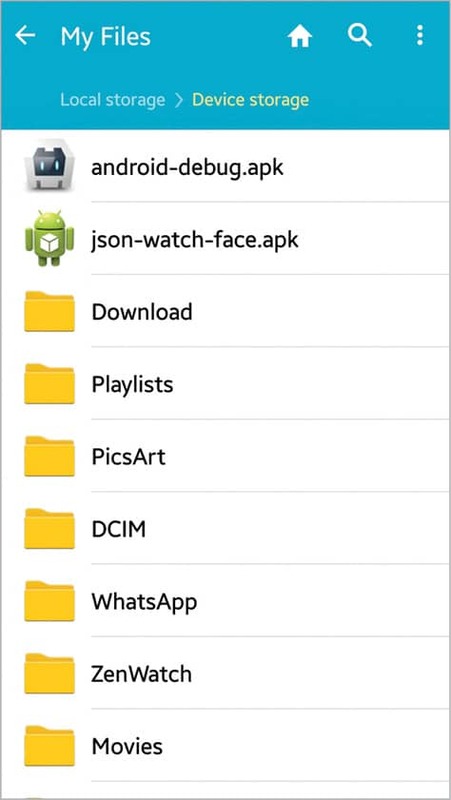 The above command statement will also create the important files required for the Android platform in the app’s platform\ directory. To build and run apps on the computer, you need to install SDKs for each targeted platform; or if you are using a browser for the development, you can use a browser platform that does not require any platform SDKs. This check is necessary to make sure we have installed all dependencies. We are now going to create the app for an Android mobile phone; we have already created directories and other important files for this app. We have added the icon that we have downloaded and stored in the img directory to the HTML file. So, when we open index.html in the Web browser, the image will appear in the top-centre position. When we click or press this image on our mobile, it will trigger an event code, which we are going to write in the index.js file located in the js/ directory, where all app logic is written. The index.css file is used to add CSS styles to our application. We have just added a simple CSS code, which turns the background colour of the app white. initialize(): This is a default application constructor. It makes a call to bindEvent() when the application starts up. bindEvent(): This is a bind event listener that binds events such as load, deviceready, offline, etc, which are required on start up. In the above code, this function is listening for the ‘deviceready’ event. Once the device is ready, it makes a call to onDeviceReady(). onDeviceReady(): This is a ‘deviceready’ event handler; in this function, we make an explicit call to app.receivedEvent(), which specifies the device is ready. We have added the plugin code to turn on the flashlight of the mobile’s camera in this function. We have added a click event listener to an element whose ID is ‘torch’, which means that when we click that element, the window.plugins.flashlight.toggle() function is called. In simple words, it toggles the flashlight on/off, when we click the element. receivedEvent(): This function is used to handle the deviceready event. We are done with the coding part; now let us build the .apk file of the app so that we can install it on our Android mobile phone. 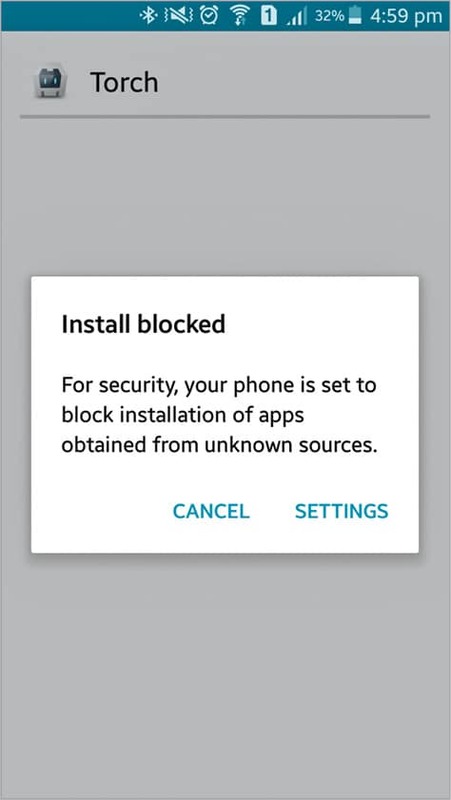 This command generates a .apk file at C:\project\torchapp\platforms\android\build\outputs\apk\ location in our project directory with the name ‘android-debug.apk’. Note: You can use the cordova build command to build the app for multiple target platforms such as iOS, Windows Phone, etc, by suitably replacing the keyword android in the above command statement. 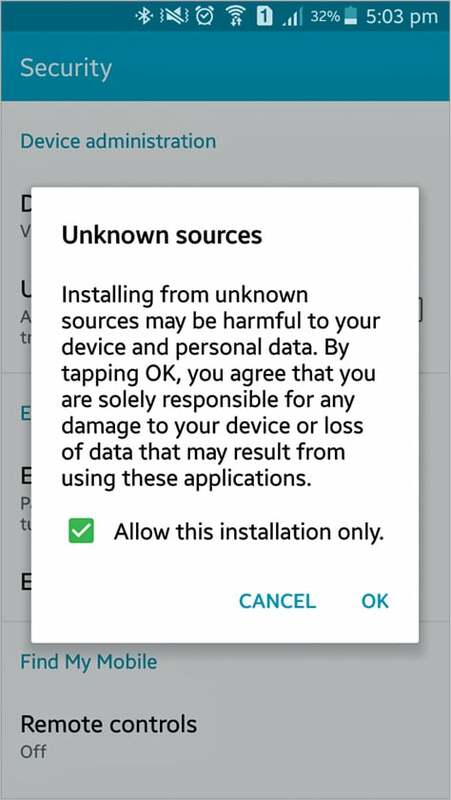 Now copy or transfer the android-debug.apk file to your phone via USB cable or Bluetooth, as shown in Figure 1, and install it (while installing, you may receive an ‘Install blocked’ message, as shown in Figure 2. So click Settings, check the ‘Unknown Sources’ option and select ‘OK’, as shown in Figure 3). This will now give you access permission of the app; next, click on ‘Install’. After installing the app, open it as shown in Figure 4. 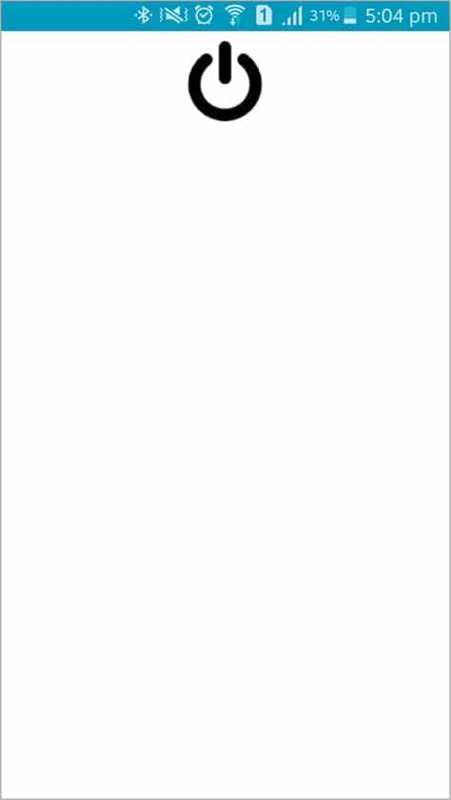 Since this is a torch application, we have created a white background for the app, so the user can use the bright screen light as well. When you open the app, you will see a black power button image at the top-centre. Click on it to toggle the mobile camera flashlight on/off. Note: You can also refer to and download this project’s source code from my GitHub repository. Visit https://github.com/aniketkudale/torch-app/.